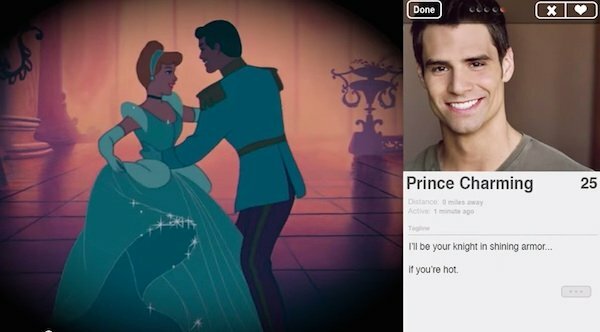 BuzzFeed shared the above video, which takes one single lady and puts her in the company of a number of eligible Disney princes. 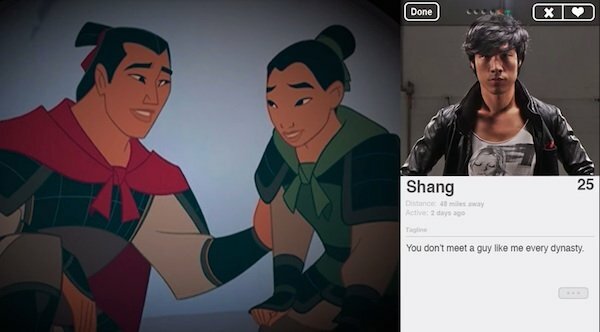 After a series of really weird dates, this princess is taking a page out of Elsa's book in going her own way, because "being single never bothered me anyway." He's the kind of guy whose dad throws him a party so he can meet the (rich and beautiful) woman of his dreams. But this Cinderella's quick to make an excuse and bolt, leaving one soon-to-be Instagrammed photo behind. 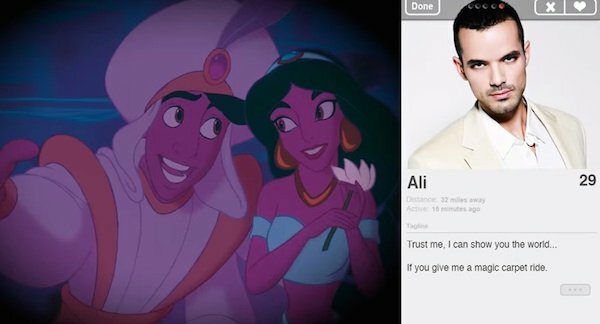 As it turns out, he's kind of creepy as he seems really eager to kiss Snow White when he thinks she's dead. 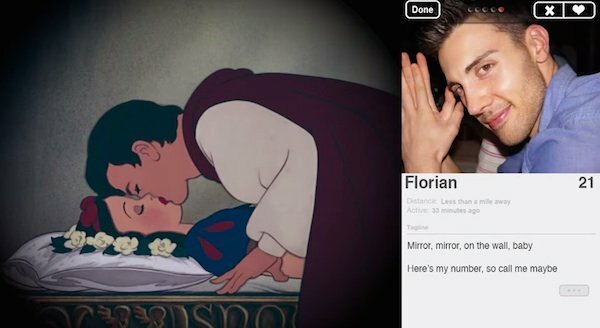 Fortunately for Snow White, she's got a cell phone full of texts from seven other guys. 26 messages from sneezy? Either he's a bit over possessive or more than likely, frequent sneezing makes for a lot of accidental text-sends. This Beast needs his space. Stay out of the bedroom, and don't mind the fact that he sometimes talks to a candle. The all-caps in his profile should be a big red flag that this guy likes to yell. 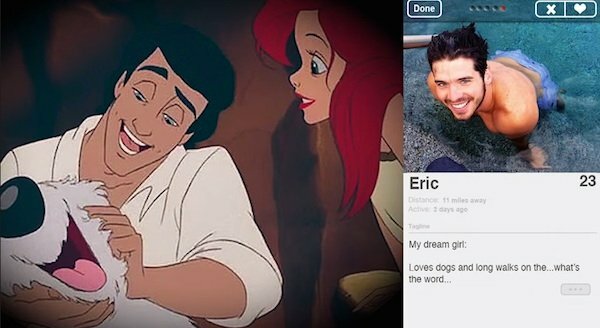 I don't know, he seems way more familiar with and interested in his dog than he is his supposed girlfriend. 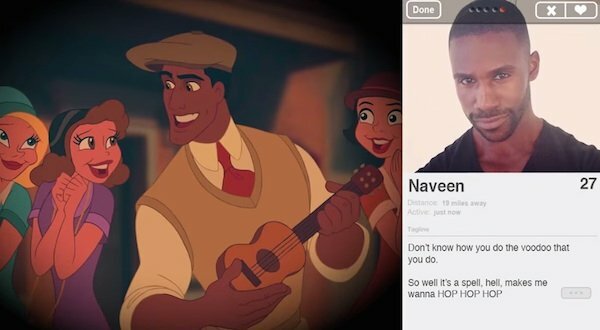 What's the problem with The Princess and the Frog's Naveen? Ok, he's a compulsive liar who sometimes plunders, but he puts on a good show, and not a lot of guys can pull off the open-cardigan shirtless look. He loses points by making "cave of wonder" sound like it means something else. 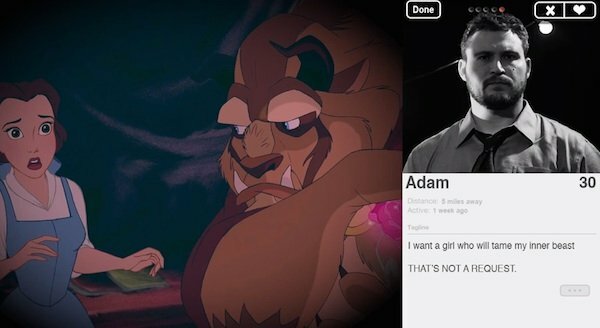 Let's get down to business here, because what girl doesn't want a guy to make a man out of her? Guess not.